You’re going to love these healthy, crispy, salty, sesame air fried brussels sprouts even if you think you won’t! Let me explain! I hate Brussels sprouts, or at least I thought I did until recently. I first had some that I liked a few years ago at a restaurant in Seattle called El Gaucho. My friend said, “We have to get these as an appetizer! They are delicious!” I thought and said to myself, “Yeah, right.” But she’s a foodie like me so I trusted her opinion. They were crispy and fabulous but also fried in duck fat – aka – not so healthy. Then I had another delicious version while on vacation in Hawaii. The chef at Roy’s at Ko ‘Olina made us a special appetizer treat (thanks to our waiter Neil and bartender Kurt) – grilled brussels sprouts with pork bits in a parmesan cream sauce. OMG! I thought it was the best thing on earth. Never tasted anything so great! One – I need to have it again. I was so in awe the first time that I didn’t truly take it all in. So clearly more eating research is needed! Two – The other issue is that it the way this dish was prepared was not very healthy and I don’t want to mess up that experience and taste, so it’s just one of those special treats for me that I have on occasion. Forget trying to make this parmesan cream dish healthy. However this second delicious experience made me want to take another look the vegetable. Maybe I could cook them in a way that I would like. Growing up, I think we always had them boiled. Yuck! My grandmother loved them and I just couldn’t see why. I couldn’t stand the smell! Keep reading and you’ll learn why! They are the most hated vegetable in America. I have to say, I am definitely not surprised. I didn’t even like anything about them until I was 48 years old. Apparently Heinz did a survey in 2008 and that is what they found. Probably because most people overcook them. 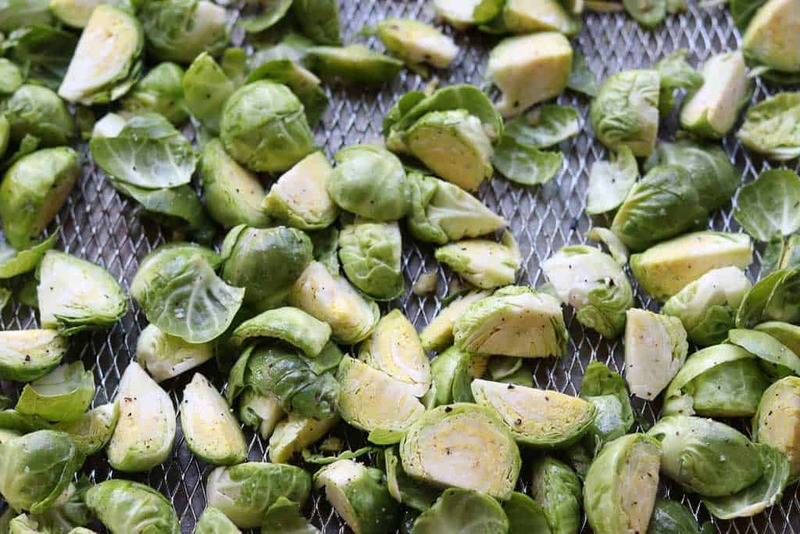 Where does the name Brussels Sprouts come from? The Brussels sprout is a member of the Gemmifera Group of cabbages, grown for its edible buds. It’s in the same family as cabbage, broccoli, cauliflower, kohlrabi, collard greens, and kale. Brussels sprouts look like miniature cabbages and grow on stalks. (All of this is according to Wikipedia). I didn’t even know how to spell them correctly until doing a bit of research for this post. I left off the, “s” on Brussels, always thought they were “Brussel Sprouts.” The name is thought to maybe have come from Brussels because of its popularity there. It’s native to the Mediterranean region and began showing up there around the 5th century but not cultivated until later. Be careful not to overcook them. That’s where the problem is. 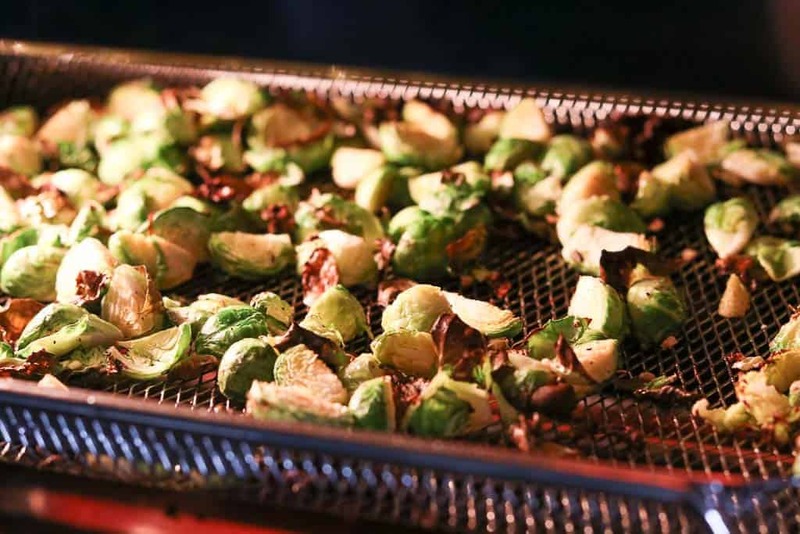 Brussels sprouts are typically boiled, steamed, fried, grilled or roasted. Be careful not to overcook them however because they will give off an unpleasant odor that contains sulfur. Maybe that’s why I never liked them as a kid, they were always overcooked and smelled horrible. How good are Brussels sprouts for you? They are low in calories, high in nutrients such as fiber, vitamin K, vitamin C as well as beta carotene, folic acid, iron, magnesium and fiber. They’re also high in selenium, which is associated with reduced risks of certain cancers. So yes! They are good for you! However, if you are on blood thinners or anticoagulants such as Warfarin, you may need to be careful with the amount you eat – as the vitamin K helps to clot blood which you don’t want if you are on blood thinners. My new favorite 0-1 point healthy snack! While writing up this post, I completely devoured a pound (yes, literally 1 pound!) of these Crispy Sesame Air Fried Brussels Sprouts. The great thing about them is that they keep you full for hours! I like them better if you use 1 T. sesame oil, you taste the sesame more. But if you want a 0 point snack, use sesame oil from your oil mister. Delicious, healthy, crispy, air fried sesame brussels sprouts in no time! Rinse brussels sprouts, trim off ends and cut into quarters. 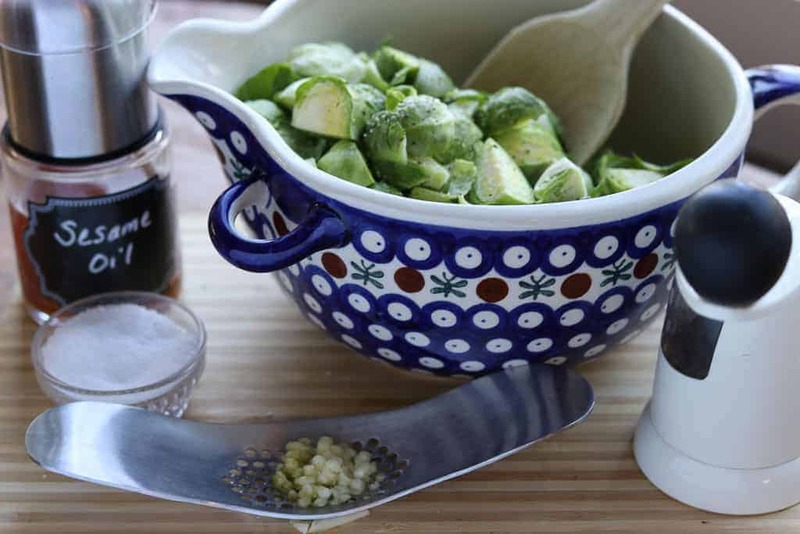 Place brussel sprouts in a medium bowl. Add sesame oil, garlic, salt and pepper. Combine well. Place brussels sprouts in air fryer basket. 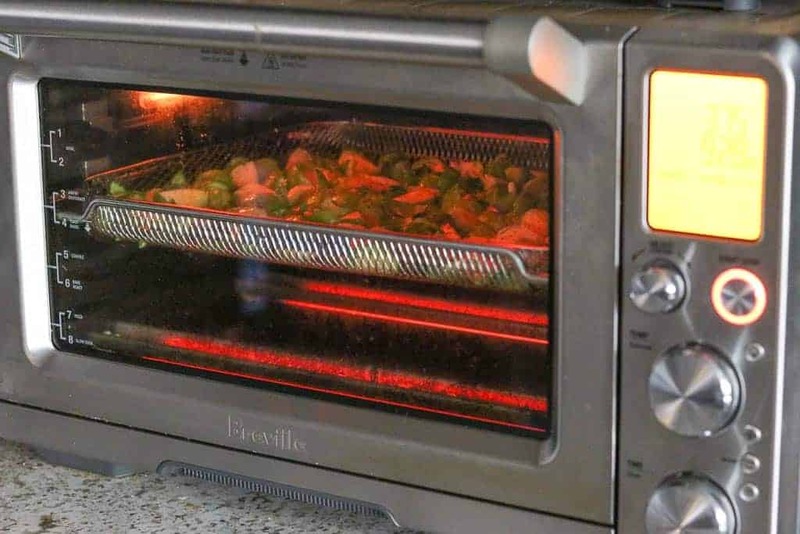 I have the Breville Smart Oven Air – so I can do them all at once. (You may have to do yours in batches if you have a different air fryer). Fry for about 10 minutes. Stir them at about 5 minutes. After 10 minutes, check to see if they are done. If not, continue to air fry for a few more minutes. Air fryers are all different so watch them so they don’t burn. After 10 minutes, check to see if they are done. If not, continue to air fry for a few more minutes. Because these are cut into quarters, they tend to fry fairly quickly. Serve immediately when hot! Now it’s your turn! 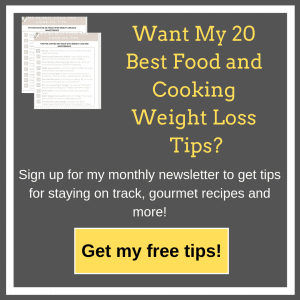 Make the recipe and tell me what you think! 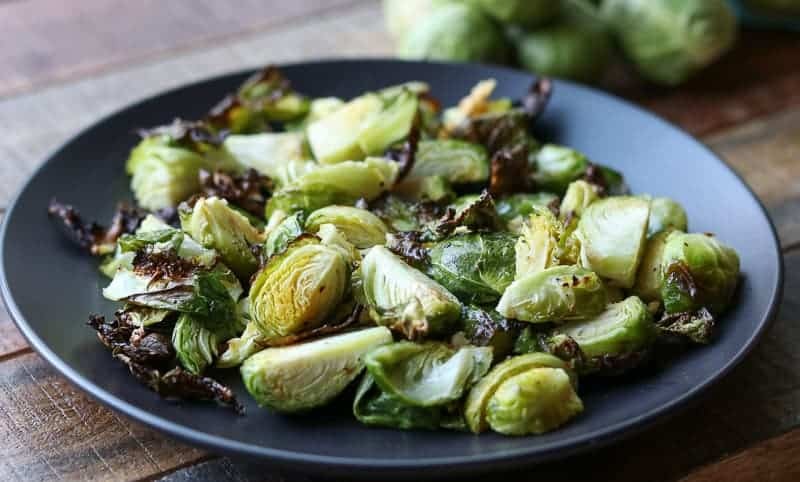 If you’ve always hated brussels sprouts, check out this recipe – Crispy Sesame Air Fried Brussels Sprouts. You’ll love them, crispy, salty and delicious! Give brussels sprouts a second or third or fourth chance! 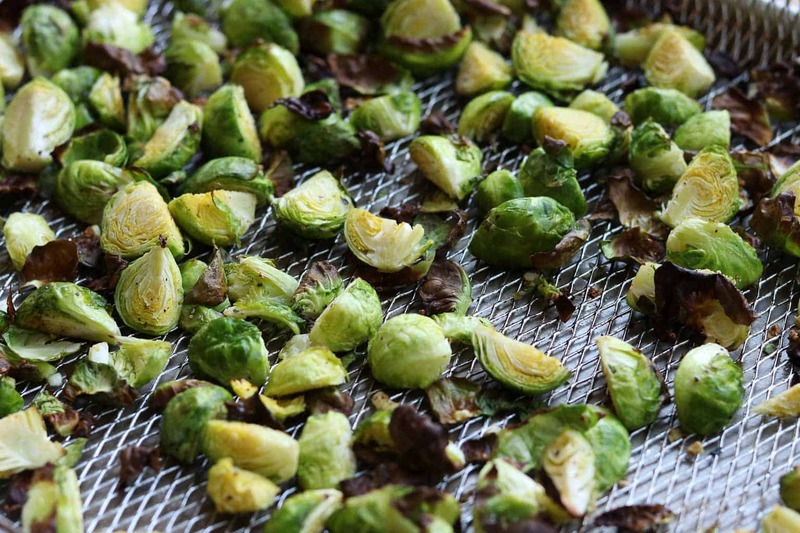 Rinse brussel sprouts and trim off ends and any brownish leaves. Cut in quarters, if leaves fall off, keep them, they taste great. 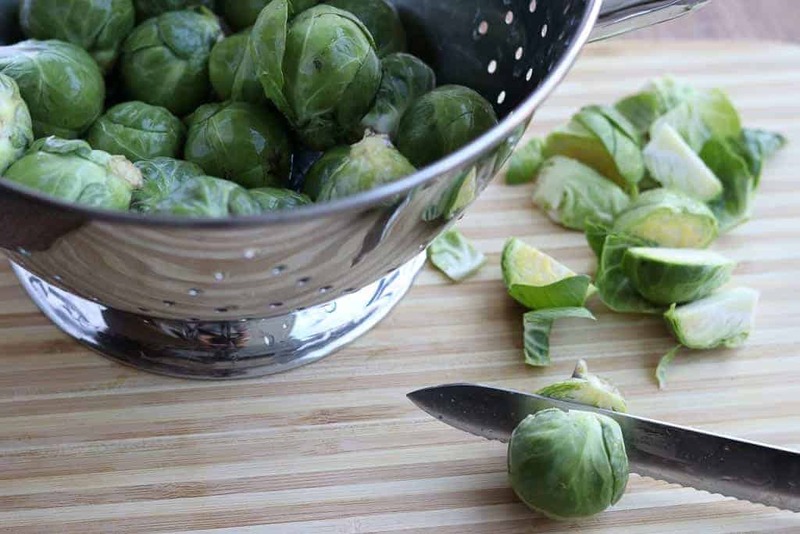 Place brussel sprouts in a medium bowl. Add sesame oil and combine well. Add salt and pepper to taste. I tend to add quite a bit of salt as I like them crispy and salty. Place in air fryer basket ( I have the Breville Smart Oven Air – so I can do them all at once, you may have to do yours in batches) and fry for about 10 minutes. Stir them at about 5 minutes. After 10 minutes, check to see if they are done. If not, continue to air fry for a few more minutes. Because these are cut into quarters, they tend to fry fairly quickly. See notes at bottom. Air fryer times are all different depending on models and brands. Check on the brussel sprouts frequently if this is your first time making them. I love my Breville Smart Oven Air because the air frying baskets are large and you can do so much in the oven besides frying. These may not get as crispy as other recipes for air fried foods as I’m trying to keep it on the healthy side by not using as much oil as other recipes do. 2 Replies to "Crispy Sesame Air Fried Brussels Sprouts"